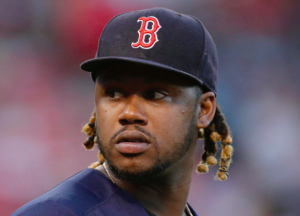 In a rather surprising move, the Boston Red Sox have parted ways with veteran slugger Hanley Ramirez. As expected, the Red Sox activated Dustin Pedroia from the DL on Friday. To make room for Pedroia on the active roster, the Red Sox designated Ramirez for assignment. The move will essentially end his tenure in Boston and leave the Red Sox in search of a trade partner. The 34-year old Ramirez was arguably Boston’s best hitter early in the year outside of Mookie Betts. Ramirez hit .341 with an OPS of .906 in April. As expected, he and Mitch Moreland have split time at first base early in the season. However, Ramirez has seen his offensive numbers plummet in May. He’s currently hitless in his last 20 at-bats and is hitting .163 during the month of May. Nevertheless, Ramirez is still hitting .254 on the season, contributing six home runs and an OPS of .708. After the way he swung the bat in April, he’s clearly got something left in the tank and could easily heat up again at some point. Alas, the Red Sox weren’t interested in waiting for that to happen. The Red Sox now have a week to find a team willing to take Ramirez as part of a trade. That may be tough with Ramirez owed roughly $15 million the rest of the season. Boston may have to pay a significant chunk of that salary to entice a team to take him. If not, they’ll be on the hook for his entire 2018 salary. However, parting ways now takes away any chance of his $22 million option for 2019 vesting when Ramirez reaches 497 at-bats on the year. With Pedroia coming back, most assumed it would be Blake Swihart to lose his roster spot. Swihart is hitting .133 in just 30 at-bats this season. He’s essentially serving as the team’s third catcher. Swihart has played so sparingly this year that his agent recently asked the Red Sox to trade him. But instead of trying to find a trade partner for Swihart, the Red Sox have chosen to dump Ramirez. With Ramirez out of the picture, Moreland will be Boston’s everyday first baseman. Moreland has been one of the team’s best hitters this season, batting .311 with an OPS of 1.001. He’s been less productive against left-handed pitching but has still held his own against southpaws. Moreland’s performance no doubt made it easier for the Red Sox to cut ties with Ramirez. Prospect Sam Travis could be recalled to platoon with Moreland if needed. As for Ramirez, his big league career isn’t likely to be over after this. Even if the Red Sox can’t find a trade partner, some team will take a chance on him should he be released. Ramirez hit 23 home runs last year and 30 the previous season. Prior to his current 0 for 20 slump, he was hitting at a .287 clip. He was also 8 for 14 during last year’s postseason. Ramirez appears to have plenty of baseball left in him, and some team is going to see what the Red Sox didn’t care to see.